As Jelastic Java cloud is gaining popularity we decided to start sharing some of the application component statistics we are seeing among our userbase. 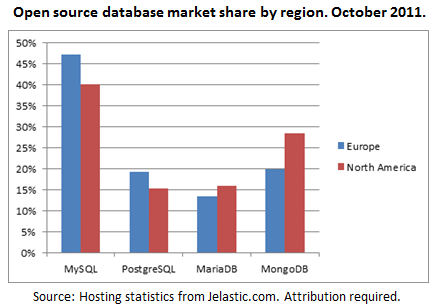 Today Jelastic is available in North America and Europe, and supports 4 major open source databases: MySQL, Postgres, MariaDB and MongoDB – which gives us pretty good visibility into the popularity of each of them. So without further ado here are the stats for October 2011. Kind of no surprise that MySQL is ahead of everyone else. Incredibly good result for MariaDB – considering that they have gotten to the market just recently (congrats Monty!) 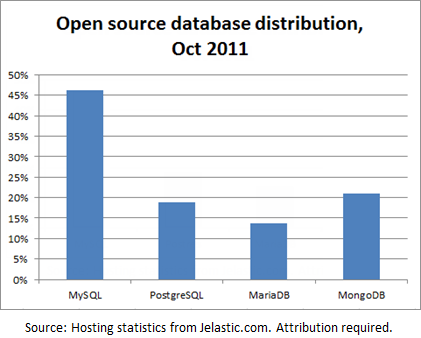 And huge success of MongoDB – probably because at the moment they are the only NoSQL database we have in production. Over time we plan to support more databases and release monthly updates on the trends – so stay tuned!